Documenting is a vital component of our lives and massive amounts of data have been recorded every day by individuals, which assist in educating themselves about diverse themes. Undoubtedly, the importance of using various visual works and novel techniques to create striking documentary works seems essential to engaging and attracting a larger public. From my point of view, installation art has an enormous capacity to depict a documentary story by opening a novel window on the world, revealing the interwoven layers of life, and to expand more dialogue about social issues. By focusing on documentary-based installation art, this essay will explore the effectiveness of installation art as a form of documentary, that is, of communicating the need for social change with today’s audiences. It is important to understand whether or not documentary-based installation artwork can faithfully transfer information and educate viewers. To test this theory, I will analyze some samples of installation works by artists such as Abbas Kiarostami, Robert Lepage, Alfredo Jaar and Ai Weiwei. Definitions frequently alter over time, partly because at any given moment no single definition covers all works that we might consider documentary. Installation art is one of the possible ways of describing reality and transferring some significant messages. It can be in service of historical and educational resources through its visual representation of a moment and to communicate something of importance for the sake of influencing the public. I suggest that if an installation artwork has these specifications, it was created in a documentary style. For instance, Forest Without Leaves is a fine art installation artwork by Abbas Kiarostami, which follows all the key foundations of a traditional notion of installation art. 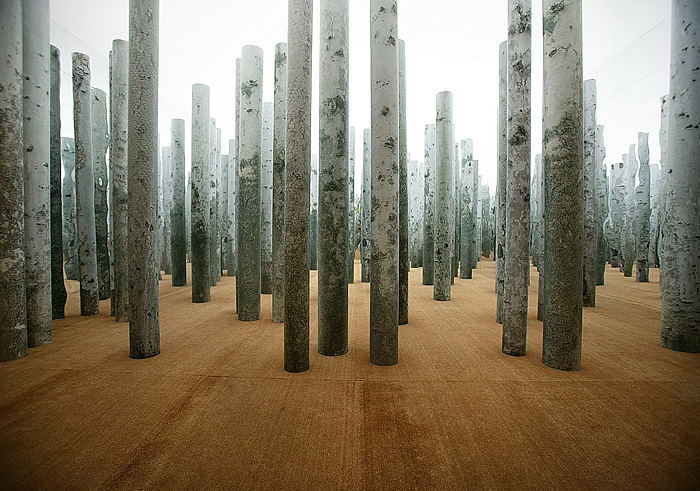 (Figure1) Kiarostami’s work is a three dimensional forest of trees, made up of eighty gigantic hollow tubes, five meters in length entirely covered by life size photographs of bark. Kiarostami creates the illusion of an infinite space by building an enclosure, covering its vertical surfaces with a mirror. Source: (Figure1), Abbas Kiarostami, Forest Without Leaves, 2005. The audiences can walk between these tubes and even touch them and explore the sense of being in an imaginary forest with the essence of Persian poetry and painting. Kiarostami believes that “we have lost the ability to look at nature in natural surroundings”  and we have trained to only look at the elements in nature once they have been presented and placed in a museum environment. Through this installation the viewer is persuaded to take a closer look at the world around them. In my opinion, Forest Without Leaves is a fine art installation artwork. In comparison, Lepage’s project, Image Mills, illustrates the differences between a fictional and a documentary based installation work. Source: (Figure 2), Robert Lepage, Image Mills, 2008. A visual document about history has a very influential and moving impression. Indeed documentarians can portray the truth and provide us the opportunity to dig into history, investigate it, and learn about the past. Sekula (1983) writes: “Clearly archives are not neutral; they embody the power inherent in accumulation, collection, and hoarding as well as that power inherent in the command of the lexicon and rules of a language.” Image Mills delivers historical information and it underscores the fact that our experience of the documentary is going beyond its conventional concept, to demonstrate the capability of installation art to depict a documentary story. Although individuals may have access to the Le Musee National des Beaux-arts du Quebec or the National Film Board of Canada  and be able to dig into the archival footage about the city and learn about it, this dazzling installation art broadcasts major events from the city's history in an imposing way to an enormous amount of people while entertaining them as well. The Image Mill contains characteristics of a documentary work by representing the history of Quebec City and can add a new dimension to popular memory and social history. As Nichols notes: “Documentary re-presents the historical world by making an indexical record of it; it represents the historical world by shaping this record from a distinct perspective or point of view. The evidence of the re-presentation supports the argument or perspective of the representation.” Consequently, this kind of installation art attracts the viewer’s attention to learn about a particular subject and because of the use of new technology it may have more effect on a viewer in comparison to watching the same materials on television or reading about it. Approximately, five thousand people could view this work from various positions and angles in the port which is not possible in a movie theatre or an art gallery. Advances in technology have altered the conventional concepts of space and time within installation art as well. 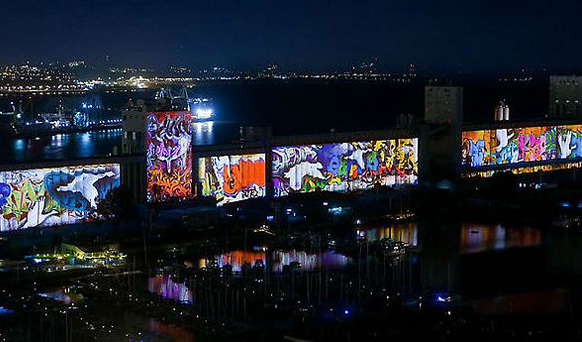 Consequently, much installation art has become more compounded evolving into interactive multimedia events. Displays of work now combine a flexible method and it contains a product of machine-based audiovisual technology, such as video projection and computer generated images. However, some installation artists argue that because contemporary multimedia installation art contains electronic media, (existing only as light or electronic signal), which being considered non-physical material, it cannot be categorized with previous forms of installation art. An excellent example of a documentary based installation artwork is The Geometry of Conscience by Chilean-born artist Alferedo Jaar, at the Museum of History and Human Rights in Santiago, Chile. This installation art functions as a memorial to the victims of the Pinochet regime. Jaar’s installation is positioned in a subterranean room on the museum grounds, where audiences are only permitted to enter in groups of ten. The viewer arrives in an entirely dark room. While viewers’ eyes get used to the darkness, light rises from a display of headshot shapes after a minute of darkness. The lighting increases from ten percent to hundred percent intensity in excess of ninety seconds. At the same time as the lights get higher, the mirrored sidewalls create a sense of immeasurable space. 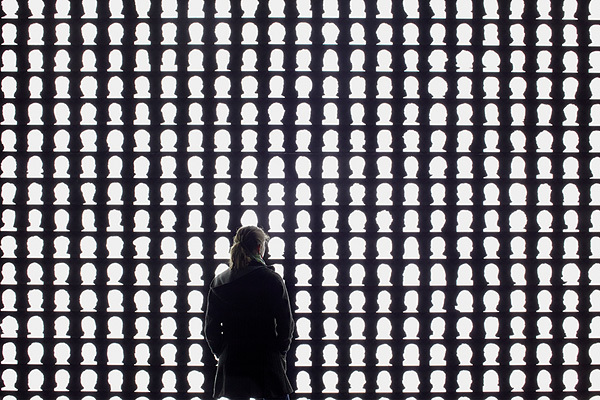 These silhouette portraits are laser-cut images of the victims and survivors of the Pinochet dictatorship regime. Viewers can observe their own faces reflected inside the sketch of the dead and living Chileans when the silhouettes’ features have been discontinued. Source: (Figure 3), Alfredo Jarr, The Geometry of Conscience, 2010. Jaar (2011) describes this installation as “an interactive narrative of historical crises” which can “engage people.” Jaar frequently creates installation artworks to encourage spectators to think about human rights and his work provides a suitable context for viewers to engage in a conversation about social justice and crisis. This is exactly what a documentary work can do. According to Bernard (2011): “Documentaries bring viewers into new worlds and experiences through the presentation of factual information about real people, places, and events, generally – but not always – portrayed through the use of actual images and artifacts.” Therefore, it can be said that Jaar’s installation art is a documentary practice. Jaar’s work provides conditions for people to slow down so that the work can engage them in a dialogue. Nichols (2001) describes: “They (documentarians) make the stuff of social reality visible and audible in a distinctive way..."
Source: (Figure4), Ai Weiwei, Sunflower Seeds, 2010. Chinese propaganda used the sun as a symbol for the leader ‘Chairman Mao’ and the mass of people are represented as sunflowers turning towards him during the Cultural Revolution. In addition, the message of this work partially is about people walking all over the cheap labor of China. Weiwei cleverly delivers a sociopolitical message about Chinese society in a unique way and his work is able to influence individuals without showing an overwhelming concept of the issue. Installation art has obtained considerable position within contemporary visual art forms over the past decade. 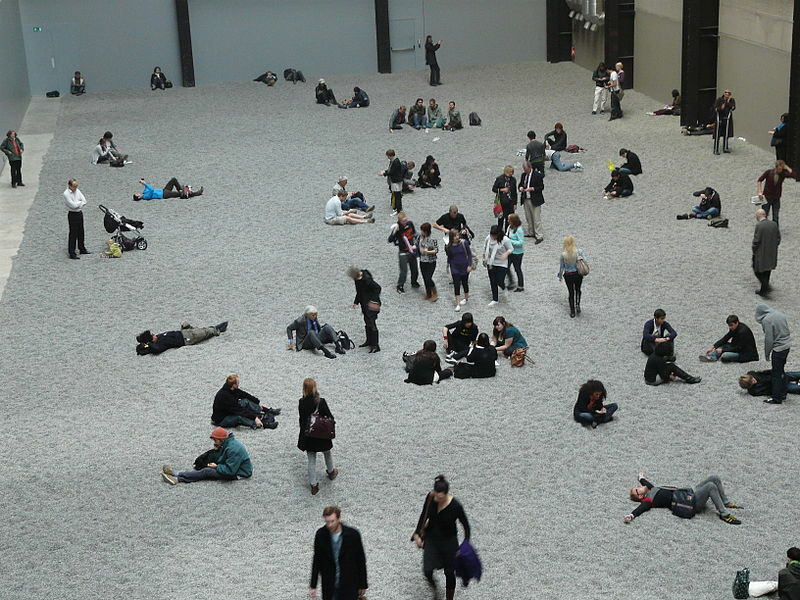 The fundamental nature of Installation Art is the participation of spectators. Rather than observing an artwork from a distance, viewers become active and navigate the work in an environment that they can experience visually, aurally and tactilely and this experience heightens their sense of vision. Furthermore, advancement in digital technology is in service of installation artists: They can expand their creativity to engage the world by representing it through various techniques of the digital platform. As Nicoles indicates: “documentary is a creative treatment of actuality…” Therefore, installation artworks are able to influence the public to broaden the viewers’ experience by showing them the unseen aspects of society. In addition, installation artworks are capable of passing on particular information about any significant event around the world. Consequently, they have an enormous capacity to represent documentary issues as they have more range of interactive potentials to give ‘vivification to fact’. 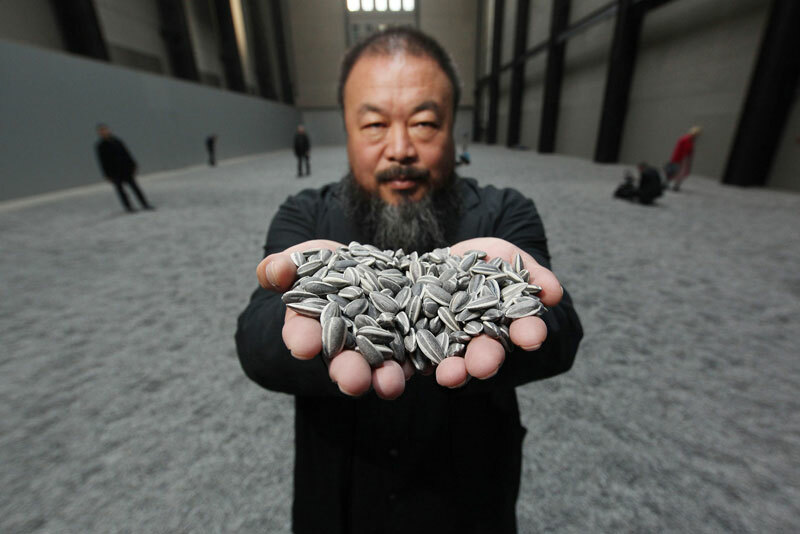 Source: (Figure 5), Ai Weiwei, Sunflower Seeds, 2010. Although the world of installation art seems fictional and imaginary, it is possible to categorize installation artworks among documentary practices. As Bernard notes: “A documentary is not a news report. It is a thoughtful presentation of a subject that has been explored, researched, weighed, considered, and shaped…” by documentarians. “Documentaries bring viewers into new worlds and experiences through the presentation of factual information about real people, places, and events, generally – but not always – portrayed through the use of actual images and artifacts.” Accordingly, observing the world through a new window in documentary practice would be possible through installation artworks. 1. Julie H. Reiss, From Margin to Center: The spaces of Installation Art. MIT Press, 1999, 13.
reality and truth; trees illustrate stamina and freedom. 4. “Iran Heritage Foundation” Forest Without Leaves, 2005, http://www.iranheritage.org/kiarostamiforest/default.htm. 5. Allan Sekula, Reading An Archive. In Mining Photographs and Other Picture. (Halifax: The Press of the Nova Scotia College of Art and design, 1983), 197. University Press, 2001), 36.9. Craig Hight, “The Field of Digital Documentary: A Challenge to Documentary Theorists.” Studies in Documentary Film 2.1 (2008), 3-7. 10. Ibid. 3.11. Kyujung Kim, Interactive Multimedia Installation Art: The manipulation of space for viewer participation, ( New York University, School of education, 1998). 13. Sheila Curran Bernard, Documentary Storytelling. Amsterdam: Focal Press, 2011, 1. 14. Bill Nichols, Introduction to Documentary. (Bloomington and Indianapolis: Indiana University Press, 2001), 2. China. He was responsible for the disastrous policies of the ‘Great Leap Forward’ and the ‘Cultural Revolution’. 16. Bill Nichols, Introduction to Documentary. (Bloomington and Indianapolis: Indiana University Press, 2001), 38. 17. Sheila Curran Bernard, Documentary Storytelling. Amsterdam: Focal Press, 2011, 1. Bernard, Sheila Curran. Documentary Storytelling. Amsterdam: Focal Press, 2011. Bishop, Claire. Installation Art: a critical history. Routledge, 2005. Edited by Shanken, Edward A. Art and Electronic Media. London; New York: Phaidon Press, 2009. Hight, Craig, “The Field of Digital Documentary: A Challenge to Documentary Theorists.” Studies in Documentary Film 2.1, 2008.
participation”, New York University, School of education, 1998. “Iran Heritage Foundation” Forest Without Leaves, 2005, http://www.iranheritage.org/kiarostamiforest/default.htm. Victoria and Albert Museum.2005, http://www.exhibitiondesign.com/projects/forest-without-leaves.php. Nichols, Bill. Introduction to Documentary. Bloomington and Indianapolis: Indiana University Press, 2001. Reiss, Julie H. From Margin to Center: The spaces of Installation Art. MIT Press, 1999. Rosenblum, Naomi. A World History of Photography. New York: Abbeville Press Publishers, 2007. (Massachusetts) & London: The MIT Press, 151-206, 2004. Sekula, Allan. Reading An Archive. In Mining Photographs and Other Picture. 1948-1968. Halifax: The Press of the Nova Scotia College of Art and design, 1983. “Tate.” The Unilever Series: Ai Weiwei: Sunflower Seeds, 2010, http://www.tate.org.uk/whats-on/tate-modern/exhibition/unilever-series-ai-weiwei-sunflower-seeds.